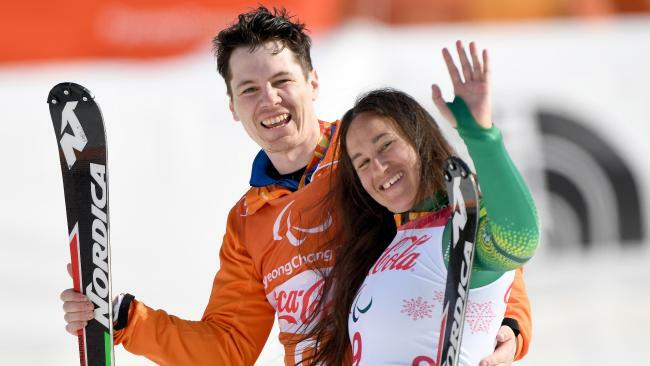 Melissa Perrine with her guide Christian Gieger after winning the bronze medal. THEY had never seen her ski before the PyeongChang Winter Paralympics, but Melissa Perrine's family are the least surprised of any by her medal-winning efforts. 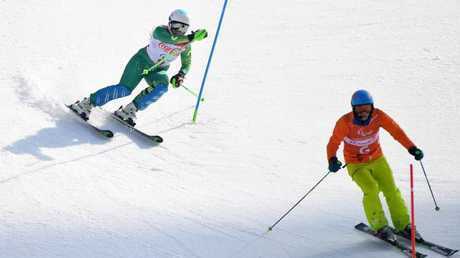 Alpine skier Perrine claimed her first Paralympic medal in her third Games with bronze in the vision-impaired super-combined. The 30-year-old could have been excused for thinking she would never achieve such a feat. After promising results in Vancouver 2010, Perrine endured a disastrous Sochi campaign four years ago when she left with a fourth, three DNFs and a controversial disqualification for duct-taping an illegal sun visor to her helmet. Perrine, who has a congenital vision impairment, is also forced to carefully manage her training and competition due to epilepsy, with a seizure resulting in 10 days off the snow. Her mother Denise, who has travelled overseas for the first time to watch her compete in PyeongChang, said Perrine's resilience has been built up over a lifetime. "It goes back to when she was born with her eyes, then she was burned when she was seven," said Denise Perrine, alongside Melissa's father Ronald and younger brother Nick. "She tripped over an urn of boiling water. It ran down her back and sides but thankfully not on her face. She still has the scars. "She's had some bad luck but it's just made her stronger. "It's hard to describe the pride. But we had that long before she took up racing." In Sochi, her then-guide Andrew Bor fastened the visor to stop the light from shining in her eyes, which renders her completely blind, as she raced in the super-combined. 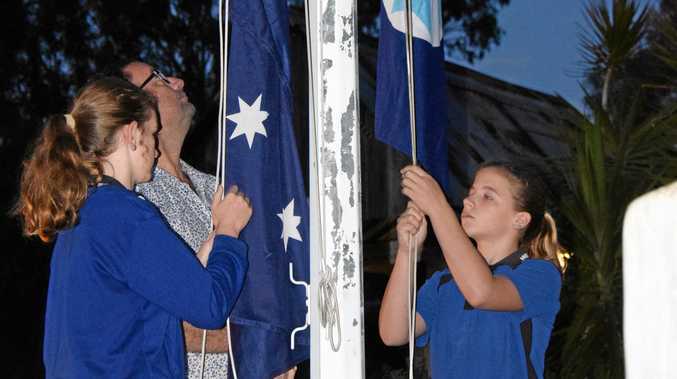 Australian Paralympic Committee chief executive Jason Hellwig criticised the pair for not being on top of competition regulations, labelling it an "inexcusable and dumb mistake". Denise said it wasn't the only time her daughter has dealt with challenges from external sources. "What happened in Sochi was disgusting. I'm sorry, but there's no other word for it," she said. "It wasn't her fault but she paid the price. "People also accused her of not training hard enough. She's had to deal with all that." Perrine still has two more events in PyeongChang, starting with the giant slalom on Wednesday.